The chances of a fascinating Mars-comet collision have dropped even lower, NASA says. If you were holding out for a completely awe inspiring, wholesome, and scientific collision between Mars and comet C/2013 A1 - called Siding Spring - then you're in for a bit of disappointment. NASA's Near-Earth Object Office at the Jet Propulsion Laboratory has reassessed the comet's course and come up with a new trajectory that reduces the odds of impact from 1 in 8,000 to 1 in 120,000. A collision would have brought Siding Spring's million year journey to an end. Interestingly, the new estimate says that though the chance of impact is smaller, the comet will be closer to Mars than previously thought. 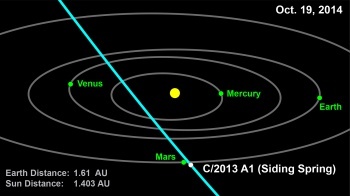 On October 19, 2014 at 18:45 UTC, the comet will pass by Mars at about 68,000 miles (110,000 kilometers). According to NASA, at the comet's closest approach it will be on the sunward side of the planet. It will be visible in the pre-dawn Martian Sky, invisible through the day, and then reappear in the evening after dusk. Siding Spring is from the outer Oort cloud, and will have taken a million years or more to reach the this point. NASA's excited about the comet, even without a collision, because it likely has a cloud of volatile gases absent from comets with shorter periods, those that frequently come near to the sun. It's still believed that while the comet won't reach naked eye brightness, observers with small telescopes in the southern hemisphere will be able to watch it pass Mars. NASA's Near-Earth Object Office routinely monitors Earth's near space for objects like comets and asteroids, then plots their orbits to see if they're a threat to Earth. If this particular science was too depressing for you, cheer yourself up with the Geekend Update, our weekly science news show.